I can’t believe the holidays are already upon us and it’s almost time to say goodbye to 2017! In terms of reading and blogging, I didn’t quite meet all of my goals. (Thank you Goodreads for allowing me to adjust my reading goal so I don’t feel so horrible every time I realize how far behind I am!) I don’t think I’m going to set many goals for 2018. I’m just going to continue plugging along and doing the best that I can. I think I have done a pretty good job of remembering that blogging is a hobby and that I read for pleasure. Though at times I have found myself teetering on the brink of stressing about a post I want to complete or pushing through a book I’m not sure I want to finish, overall, I’m still having fun with this whole blogging thing. I have lots to be grateful for this year. We moved to a new home in a beautiful neighborhood. We have wonderful neighbors who have awesome kids the same age as mine. Impromtu play dates are the best! My kids are loving their new school and have had a relatively easy time with the transition. I traveled to Italy, Costa Rica, and Whistler this year. I ate at a lot of great restaurants and drank a lot a responsible amount of great wine. I continue to have great friends in and out of my book club; real friends that I can count on to be there no matter what. (This is starting to sound like a Thanksgiving post. Late to the party as always. Moving on…) Finally, I have made and continue to make meaningful connections with fellow bloggers, authors, readers, publishers, and anyone willing to talk books with me. 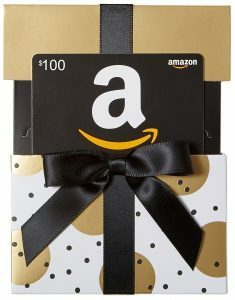 In thanks for all of the above, I’ll be doing a giveaway raffle for a $100 Amazon gift card again this year. It’ll start now and end at midnight 12/15/2017. You can use it to finish your holiday shopping, regift it (I won’t tell! ), or use it to add some heft to your December book haul. I’ll be posting a separate gift card raffle contest on Instagram later today so don’t forget to check out that one as well. What an amazing generous giveaway! What a sweet idea! Thanks for being so thoughtful! Ah, I understand. I walk the collecting/hoarding line myself and a thin line it is! But oh, the joy it brings when a shiny new book arrives! Good luck to you in the contest. Amazing, amazing giveaway Ann Marie! I’ve been lucky with your giveaways this year so my fingers are tightly crossed for this one:) I’m so glad you’re still enjoying blogging and chatting about books with the rest of us, I’m so happy that I got myself out of my funk and you’re so right, it’s a hobby and should always remain so. Congrats on your new house and I’m so happy things have went smoothly and that you have great neighbors…they make all the difference when your kids are younger! Your so lucky to have wonderful friends as well. Wishing you a relaxing, fun filled December!! Thanks, Renee! I had forgotten about your winning streak but you are right! You may be on a roll! I hope your holidays are fabulous and stress-free! What a generous giveaway! I’m glad you’re finding a balance in your blogging and reading – it can so easily slip into feeling like a job rather than a hobby if we’re not careful. It CAN feel like a job at times and that’s something I never would have expected when I began blogging. It can be hard to strike a balance between meeting commitments and feeling proud of what you’re putting out there while, at the same time, not feeling too badly if life occasionally gets in the way. That is very generous giveaway! Loving the loyalty eatries too! Don’t stress about not reaching your goals. But I understand as I do the same thing. It sounds like you had a great year in many ways. Congrats on the house and I’m glad you got to do some good traveling. You even made it to Canada 🇨🇦 yay!!! Thanks, Dee! I could have easily lamented all of the things that didn’t go so well this year so I hope I don’t sound like one of those people “living the Facebook life”. Lol. But as they say, all’s well that ends well and, in the end, it wasn’t so bad. And yes, Canada!! We loved it so much we are going back in February. I’m so glad my friend suggested it as it wasn’t even on my radar when I was looking for a ski vacation. I don’t ski so for me it’s apres all day but I want my kids to learn and their ski school was phenomenal. I could go on and on about everything we loved. The meat and dairy (Cows ice cream!) is so much better than here. It reminded me of how things used to taste here in the U.S. when I was a kid before we starting messing with our food supply. Now we have to spend a fortune on local and organic if we want good, quality food. And, of course, the people were awesome too! Thank you so much, Jan! It’s so easy to get caught up in the daily stresses of life. I sometimes need to remind myself that there’s plenty of good stuff too. Ready! Super exited to participate and to follow you!! Thank you so much, Jennifer! I try to keep it real. 🙂 There is never enough time for all the reading, reviewing, blog hopping and social media stuff I would love to be able to do. I’m not only in awe of them for being able to juggle so many balls, being great bloggers, and genuinely awesome people but I also have a great deal of professional respect for them. I know many people who are quite gainfully employed who don’t put in the effort that they do and it’s all for the love of reading and books!